"Fischer never makes a mistake in analysis." Frank glared across the board at Joe, who smiled sheepishly, as if that was the only explanation. They had been meeting every Thursday at the club for several years, but the last Thursday of the month was reserved for analyzing the classics. ​"Fischer says that Black is lost in every variation," Frank was annoyed, but trying to be patient, "but his analysis covers up a subtle non-transposition. Look here." They both stared back at the board, which contained Fischer’s position against Nicholas Rossolimo in Fischer’s book, My 60 Memorable Games. Frank paused to go over in his mind the logic. "The problem is that Black played the waiting move 21...b6 and then later checked on c3 with the Queen, allowing the King to go to e2 because ...Nc6 has not yet been played. ...Nc6 would gain tempo after Ke2 because Black is attacking the d-pawn. Frank thought this might be confusing, so he quickly added, "In his analysis, Fischer says ‘But Black also loses after 21...Qc3+ 22. Ke3 Nc6...’ when Black has wasted a tempo with 22...Nc6 because the d-pawn is already guarded." Joe instinctively wanted to defend Fischer, because he knew that backing Fischer’s analysis was undoubtedly much safer than backing Frank, but he also wanted to understand, so he twisted the b-pawn with his right hand and said helpfully, "but you think that moving the b-pawn is not a mistake if the Bishop is pinned on d3." "Right. It may not be the best move, but it makes much more sense than it did on move 21, when Rossolimo played it. Black has to commit White’s King first, and then, depending upon where the King goes, maybe play the waiting move later." Joe had the book right in front of him. "Why doesn’t that transpose into the game? After all, in the game continuation 21...b6 22. h5! Qc3+ 23. Ke2 Black couldn’t play 23...g5 because of sacrifice 24. Nxg5+ when the eventual Queen penetration to f6 would be decisive, especially since the possibility of reconnecting the Rooks by ...Kd7 after the Black King retreats to e8 is impossible because of the Bishop. For example, 24...hxg5 25. Qxg5 Ke8 26. Qf6 Kd7 27. Bb5+"
"That is the point." Frank was clearly getting enthused, "If Black plays 21...Qc3+ first, then, depending upon where the King goes, he can prevent the Bishop check. Look at the book. Fischer gives 21...Qc3+ 22. Ke3 Nc6 with an eventual winning line for White. But with the d-pawn overprotected by the King on e3, Nc6 is no longer as logical. Black needs the Knight to defend the Kingside after h5. In the game, after 22. h5 Black had to allow hxg6+ opening the Kingside. But with the Knight back on e7 and the pawn on h5, if the Bishop is pinned, Black can probably try ...g5 because the white Bishop is can’t participate as in the line you just quoted." "So how does Black avoid both the game continuation and Fischer’s note?" Frank was waiting for this moment. He gave Joe his famous "Aha" look and said dramatically, "by giving Fischer the choice of the pin..." and he dramatically checked on c3 with the Queen, "...or the lack of overprotection. If he choses the pin with Ke3, then maybe wait with ...b6. If he choses Ke2, trying to transpose, then..."
"Nc6! will win the necessary tempo!" "Exactly. For example, on 21...Qc3+, if 22. Ke3 as in Fischer’s analysis, then Black does not play 22...Nc6, but 22...b6. If Fischer then tries 23. h5 as in the game, then 23...g5 will now work, because if 24. Nxg5 hxg5 25. Qxg5, then 25...Ke8 works because the Bishop is pinned. White can’t at that point simultaneously play Ke2 and Qf6. If 26. Qf6 then Kd7 holds, as Black retains his material." "And if Fischer tries 22. Ke2?" "Well, at the very least his analysis is wrong! Anyhow, after 22. Ke2 the d-pawn is unprotected, so 22...Nc6 now works, as Black has not wasted a tempo on ...b6. For example, 23. Ke3 Nb4 threatens the a-pawn and Nxc2+. If Fischer tries to just give up the d-pawn with 23. Rab1, then after 23...Nxd4+ 24. Kf1 then 24...b6 still leaves Black breathing for a while." "So really Fischer is between a rock and a hard place after 21...Qc3+. He can’t have his cake and eat it, too, as his analysis implies. 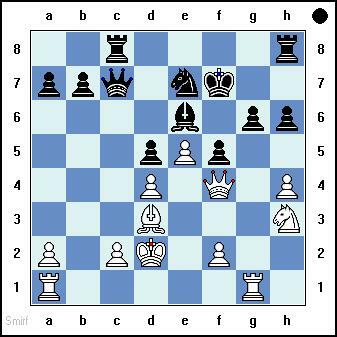 His King can’t simultaneously be on e3 to protect the d-pawn and on e2 to be out of the pin." Joe was pleased that he had made the analogies. He tried to think of some other cliches that might apply, but Frank didn’t even notice his attempt at humor. "Right, Joseph. In the book’s analysis Black does the wrong thing each time, so White wins. But if Rossolimo forces Fischer to choose a King position one move earlier, Bobby must give him a path of defense." Using Fischer’s first name made Frank feel a little more powerful. While pleased with his understanding of the problem, Joe wasn’t really satisfied that Frank was qualified to set the record straight. "Maybe we should send this to Larry Evans." "Who?" Frank knew who Larry Evans was, but he was trying to imply that there was no need to question his analysis. Joe was oblivious to Frank’s sarcasm. "The Grandmaster who answers questions in Chess Life. He helped Fischer write the book and often gets questions about it. Almost all the time he defends Fischer, although once or twice he has admitted that the letter writer may have found something new." "Go ahead if you want. It doesn’t make that much difference to me." Frank was now clearly losing interest. "Because Fischer would have won anyway." Joe was surprised. For what purpose had Frank put him through all that? "But I thought you said Fischer was not winning as he claimed?" ​"I don’t think he was winning." Frank smiled to emphasize that he was amused by Joe’s confusion. He got up to look at some of the other club games, stopped, and said over his shoulder, "I think he would win because he was Fischer."